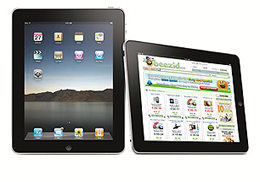 Which Penny Auction Site Has Easy To Win Ipads? Apple iPads are practically a staple at the top penny auction sites. They continue to be among the most popular electronic goods with bidders, and thus nearly every site puts them on offer. But of course, some iPad penny auctions are better than others. Some have less competition than others. And some offer features that you, like us, might prefer when trying to win an iPad at penny auction sites. This page will give you a top-down view of the best iPad penny auctions that we have reviewed thus far. We’ll also highlight our “top choice” – the site we feel offers you the best chance to win an iPad. And we’ll provide a few tips you can use to improve your odds. As you can see from the list, Quibids is our top choice. They are the largest penny auction site, and routinely attract floods of bidders. That gives them the leverage they need to host frequent iPad penny auctions. You’ll find at least one – and usually more – offered nearly every day. One of the advantages of their size is that you’ll have a better chance of choosing the specs you want in your iPad. The high volume of traffic you’ll see at QuiBids translates into more competition. While penny auctions to win an iPad are always popular, those held at QuiBids can become frenetic. We strongly encourage you to read our QuiBids strategy page before getting started. Are The Other iPad Penny Auction Sites Worth It? Given that QuiBids is our “top choice,” does it make sense to get involved with other iPad penny auctions? Absolutely, and here’s the reason: other sites provide a completely different bidding experience than QuiBids. Even though they may offer less variety and fewer auctions with iPads, you may stumble across the precise model you want. Most of the sites on our list (see above) receive less traffic, so there will be fewer bidders with whom you’ll need to compete. Also, it’s worth underscoring that every iPad penny auction site on our list has its own set of strengths. For example, HappyBidDay ships very fast; Beezid provides bidders with potent bidding tools; and BidRivals offers a huge pack of Bonus Bids to new members. While QuiBids is our favorite penny auction to win an iPad, we recommend that you visit all five sites. Some people like to have the “Buy It Now” (or BIN) option available. That way, they can take advantage of it in the event they’ve gone deep into an auction, and believe there is a chance they will lose. By using the BIN option, you can apply your submitted bids against the price of the item. A lot of people consider this to be a good fail-safe measure. Other bidders prefer penny auction sites at which the “Buy It Now” option is unavailable. There is a very savvy strategy involved. Without a BIN option, each bidder is forced to assume a higher level of risk. That alone is often enough to discourage bidders (your competition) from bidding. This is a matter of preference. From our list above, Quibids and BidRivals both allow you to “buy it now.” HappyBidDay, Beezid, and BidCactus do not. First, come prepared. Don’t show up at an iPad penny auction with 20 bids. You’ll end up losing your money without winning the device. Instead, buy at least 100 bids (take advantage of BidRivals’s 100 Bonus Bids), so you’ll be able to compete. Third, leave your emotions at the door. You may be excited by the chance to win an iPad for pennies on the dollar. But set that excitement aside. Like poker, emotions in penny auctions will get you into trouble. Lastly, read our “Bidding To Win” page. We’ve created a long list of tips with which most bidders are unfamiliar. Use that to your advantage. On a side note, if you plan to get involved at Beezid, spend a few minutes getting up to speed on our Beezid bidding strategies. It is possible to win an iPad at the penny auction sites on our list. People do so every week. The key is knowing what you want, being willing to compete for it, and getting others to believe that you refuse to back down. Check out Quibids today for an Ipad!